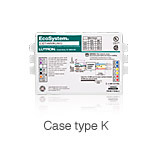 EcoSystem ballasts can be used to dim T8 fluorescent lamps, which have a 1-inch diameter and offer exceptional energy efficiency and color quality. EcoSystem ballasts can be used to dim T5 fluorescent lamps, which offer exceptional energy efficiency and color quality. EcoSystem ballasts can be used to dim T5 high output (HO) fluorescent lamps, which produce more light than the standard T5 bulb. twin-tube fluorescent lamps, which have greater energy efficiency, and fit low-profile fixtures. quad-tube 4-pin lamps, a compact fluorescent lamp (CFL) used in downlight and pendant applications. triple-tube 4-pin lamps, a compact fluorescent lamp (CFL) used in downlight and pendant applications.